TI-Nspire offers some great tools for creating well-presented interactive documents for classroom use, for presentation and for publication. There are, however, some useful things to remember when developing documents on this platform. It is assumed here that the end medium of just about every document you develop will be a handheld screen: while it is nice to take advantage of all that lovely screen real-estate available when using the software, documents developed without regard for how they will transfer to student screens are likely to be frustrating at best, and useless at worst. Where possible, documents should read equally well in both views and be created to do so; where this is not possible, then preference should generally be given to the handheld view. Fortunately, the Teacher Editions now available make it possible to check this very accurately from the software. There is one central Golden Rule for creating effective TI-Nspire documents: minimize screen clutter. The handheld screen is not a big place and very quickly becomes confused and unusable, so whatever else you do, keep this one in mind. Can you see what I mean in the image shown? 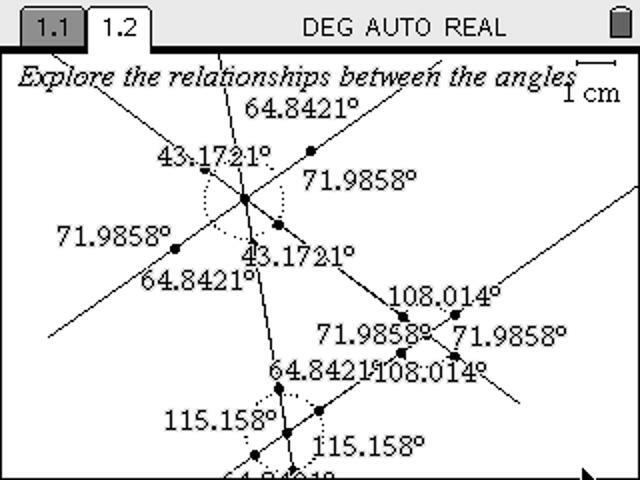 When in a geometry or even a graphing context do we need more than 1 or 2 decimal places? Is the scale (top right corner) relevant here? Then why is it shown? How much screen information is enough, and how much is too much? In general, as with any good design, just because you can does not mean that you should! With this in mind, a few more detailed Golden Rules of TI-Nspire authoring are summarized below, and then most are demonstrated using a QuickTime movie (click on the image to play). They should be read with the proviso "wherever possible" attached: like all good rules, they do not apply to every possible situation, but should be applied in general unless there is a strong reason to do otherwise. Hide all distractions. When building constructions on a Graphs & Geometry page, the ONLY things that should be visible must be those that you want the student to do something with. Hide all points other than control points. The easiest way to hide things is to right-click (CTRL-MENU on handheld) and choose the Hide/Show option (usually number 3). Obviously, hide any construction lines, or intermediate objects, leave only what is essential. This may include hiding the scale values on the axes using Attributes and hide the axes names (x and y) if desired (even hide the axes themselves if they are not required). TI-Nspire offers a dynamic environment in which students are encouraged to DO things, and the key to this action is often the grabbing and moving of a point. There is nothing more confusing than having multiple points visible and not knowing which, if any, are "live". Any lines, segments, vectors, shapes which are NOT central to the focus but still need to remain visible should be set to dotted or dashed style using Attributes, so that only the figure of central focus draws the eye. Indicate Control Points clearly. The default point is large, black and round. Use Attributes to change the style to open for all "active" points and students will soon learn to recognize and focus on these. The open style generally draws the eye quickly and stands out in most constructions. If you choose to adopt this convention, then be consistent - try and remember to always indicate control points in this way. Choose Point (or Point On if using the grid) and place the point where you want your text to appear. As soon as you click to drop the point, type the text that you wish to display: it will appear as a label for that point. Right-click (CTRL-MENU on handheld) and choose Attributes for your new point and arrow all the way to the last point style to make the point as small as possible (NOTE: if you hide the point, you hide the label). Grab the text label by the very first letter (the extreme left) and drag it to cover the dot point (if you grab the label anywhere else its movement is unpredictable). You now have your text positioned and this will remain relatively placed on changing between computer and handheld view - you may need to reposition the text slightly when in handheld view for best layout effect - this is best done by grabbing, not the text label, but the point underneath the first letter and dragging it to where you want it to be. If you wish to display several lines of text then, after placing the first point and text as desired, use the Parallel construction tool to draw a line through your first point (under the first letter of your text) and parallel to the y-axis. Then use Point On to place subsequent points on that line and your text will align neatly to the left. Pointer Arrows: If you are using text, at some stage you will probably want to link your text to an object using an arrow: suppose we wish to point to a given coordinate point (it might be a vertex of a triangle, for example). You should have the point that is the object of interest, and a point attached to the text label. Use the Segment Tool to connect these two points. Now choose the Vector Tool (also in Points and Lines Menu) and click first on your label point to start your arrow, and then click somewhere along the segment (NOT at the very end). Now hide the end point of the vector and the segment underneath. It is much better for your arrow NOT to go all the way to the object in question since it can obscure that object. Finally, use Attributes of the vector to make it dotted or dashed. To Reflect or Flip a point or object, choose Reflection from the Transformations menu, then click on the line of reflection (axis of symmetry) and then on the object to be reflected. To Translate or Slide a point or object, you need a vector which gives the direction and size of the translation: create your vector, then choose Translation from the Transformations menu, click on the object to be moved, then on the vector and you will get your image. If you place the vector on a segment (as described above) then grabbing the endpoint of the vector will allow the image to be slide along the segment (which should be hidden or dotted). To Rotate or Turn an object, use the text tool to drop a number somewhere on the screen (You should set the Document Settings so that angles are in degrees for this!) Now you need an object to be turned, a point to turn it around (which may be on the object or somewhere else) and the text number gives your angle of rotation. Choose Rotation from the Transformations menu, click on the object to be turned, then on the center of rotation, and finally on the text number. By double clicking and changing that number, you can easily change the angle of rotation as required. Symmetry can be a very useful tool, especially for making sure that things are evenly spaced. Suppose you have several lines of text which you want to be spaced evenly down a page, aligned to the left. Use the technique outlined above to place a point labelled with your first line of text. Now construct a line passing through that point, parallel to the y-axis. Now choose Point On and place a point on the parallel line where you want your next line of text to begin (and immediately type in your text). Choose Symmetry from the Transformations menu, click on the new point you just created and then click on the point above it. Another point will appear on the line below, equally spaced. Again enter the text for that point. Use Symmetry again to get the next point, as required. The neat thing now is that, by dragging the point second from the top (not the first line of text but the point associated with the second line) you can automatically adjust the spacing between all your lines - useful when you switch between computer and handheld view! Avoid scrolling. Usually applied to a Notes page, it is generally better to break text over several short pages rather than expecting students to scroll down. Assume that text that is not immediately visible when moving to a page will not be read by students! This can lead to a document with many pages, but if it is important enough to be included, then you probably want it to be read. Use Correct Mathematical Formatting. Especially in the Notes application (including Question & Answer template) and also in the new Questions Application in Teacher Edition, all mathematical notation can be displayed correctly using the "Math Box" (CTRL-M). Even after the mathematics has been entered as text, simply hold down the shift-key and highlight the text, then CTRL-M will convert it to correct format. There is no excuse for expecting our students to try and interpret "computer syntax" when the proper form is readily available. Use Notes to also DO your mathematics. If you are authoring TI-Nspire documents, then it is likely that you will be using the Notes Application to provide students with questions and instructions that involve mathematical computations. 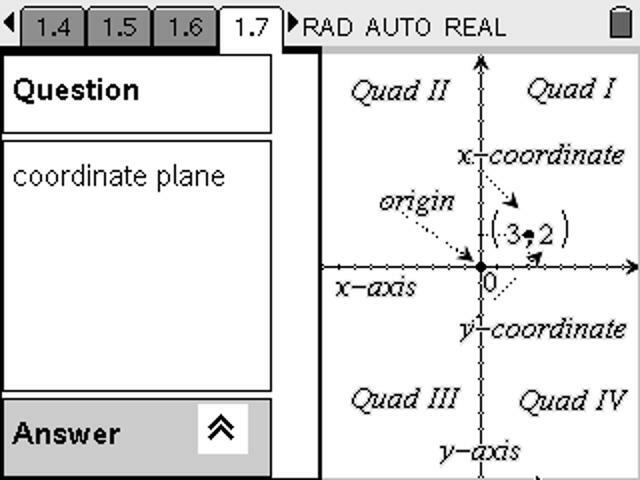 Once the mathematics has been converted or entered in a MathBox, position the cursor anywhere inside the MathBox and right-click (CTRL-MENU on handheld) and choose Evaluate (or if you have selected the contents of the MathBox, Evaluate Selection). This will carry out the computation required, if you have used correct TI-Nspire syntax - for example, enter solve(x^2-x-1=0,x), convert to MathBox and Evaluate to get the solutions to this equation. This can be a great time saver when preparing document - note, though, that the result replaces the question, so if you want to show both question and answer, just copy the question, paste the copy after an appropriate symbol (such as =>) and evaluate.